Yesterday there was a1.5K and a 3K race in Inebolu (Kastamonu) which is located near by the Blask Sea. I comptede in 1.5K race, finished by 17:52 (1st in general ranking). Ha ha I see you still have your explosive rear endpush, even with the straight arm over the top style. Sort of a stylemark of your stroke I assume.Gives a little hitch at the start of recovery. I think that recovery has smoothed out your transition to catch a bit. I have been asleep for about a year. There is more than that stupid swimming. Picking up where I left off and repeating myself quite bit in the writing I see haha. Have to loose some weight again. i dont do instagram and facebook, but I guess you are looking like a mean and lean, swimming machine, right now! What is your dryland training now? these stuff do not require instagram software, link works in any browser. i do some isometric core exercises at home but not manmakers. Due to the races I couldnt have trained well in the last couple of weeks, my pace has become weird, I used to swim the Se1 1500m free 19:15, try my best to get into form until Slovenia. note: this is my race pace, 80-84 strokes per minute, 1:16 pace. It was a good exprience before the Slovenia Masters EU Champs for me to swim with an elite and a young athlete. Swam across the current in Bosphorus Channel by wearing shorts with pockets. It would be great to be there swimming upstream in the Bhosphorous. I don't know how clean the water is though. These crazy guys also swim in winter even though they are not swimmers!!! Very sorry to hear that!! Just looked through the 50m freestyle results: attendance numbers seem quite low. 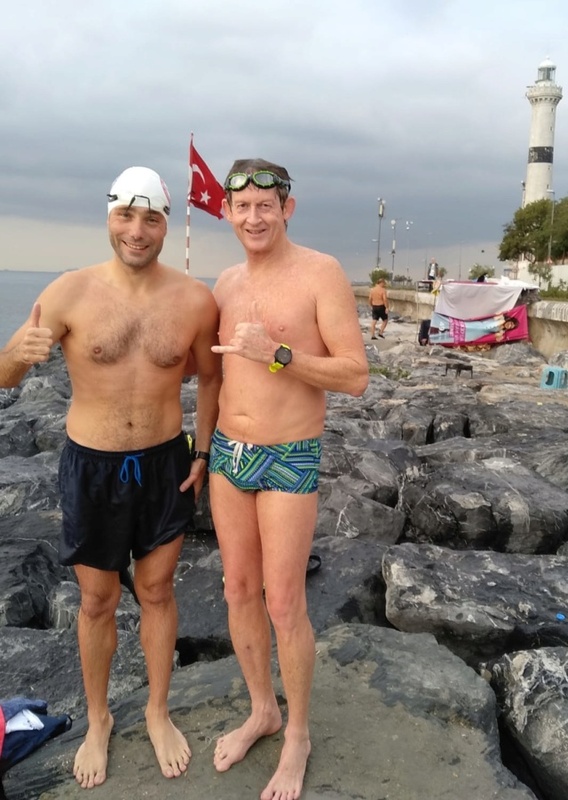 Today morning we swam with Michael Miller from Australia in Sarayburnu (Bosphorus). He is 61 years old, I had never heard about him. Today he swam with my 1:16 pace but it was so easy for him, amost recovery pace for him. I wondered and searched him on the internet, and found out that he is actually a good OW swimmer in Australia. Father, lawyer and keen OW swimmer after 15 years of cycling & triathlons. Rottnest soloist Feb16, 5th male. It was nice and a good chance to meet and swim side by side with such a great swimmer! PS: I also informed him about our forum, told him that there are lots of Aussie swimmers in our forum who might have already known him I wonder Cotty may know him ? I know him NC. He lives in Queensland and I am in Western Australia (Perth) but we met on a SwimTrek holiday in Greece in 2015. We did the Greek Cyclades trip. Yes, he's a very good swimmer! We kept in contact and we assisted with his Rottnest solo in 2016, with paddlers, boat, and support crew (6 of us from Perth were on the swimtrek week). 2 of us went over to Rottnest on the ferry with gear for him at the finish and only just got there in time! He was 7th solo across the line in 5:12 for the 20km swim. He also did a team of 4 this Feb 2018 in 4:46 and won their 200+ years mixed category.